Many observant Jews require more than the standard rabbinate kosher certification that is common in many of Israel's hotels. 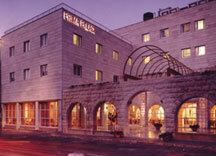 On this page, we list the Glatt kosher hotels available in Jerusalem The technical definition of glatt kosher is meat from animals with smooth or defect-free lungs, but today the term glatt kosher is often used informally to imply that a product was processed under the strictest standard of kashrut. 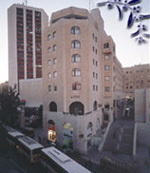 King Solomon The King Solomon hotel is located close to the city center in King David Street, 5 minutes from the King David hotel, and directly opposite the Liberty Bell Gardens. Prima Palace The Prima Palace is located in the city just off the Jaffa Road, and close to the "shuk", and central Bus station. Prima Kings The Prima Kings is located near the city center, adjoining the Great Synagogue, and opposite the Sheraton Plaza hotel. 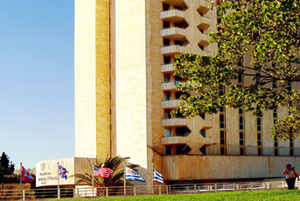 The Sheraton Plaza is a 5 star deluxe hotel, located on King George Street, within walking distance of the city center and Ben Yehuda Street. Ramada Hotel The Ramada is located by the entrance to Jerusalem, close to the new Calatrava's "Bridge of Strings". the Israel Museum, and the Givat Ram University Campus. Little House in Rehavia - B&B Brand new B&B in the perfect central location within walking distance of both the New and Old Cities. 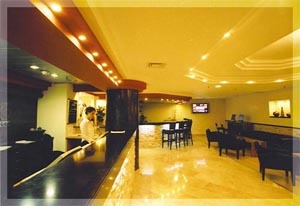 Newly renovated suites hotel . 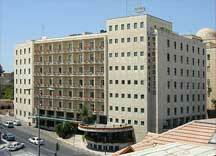 Located in the very heart of Jerusalem on King George street, 1 minute from Ben Yehuda Street. Ideal for families. Glatt Kosher LeMehadrin Rabbinate Supervision. 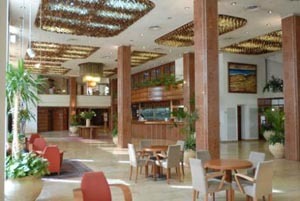 The Jerusalem Gate Hotel is a classic city hotel located at the entrance to Jerusalem with the most elegant lobby among Jerusalem hotels, bar, coffee shop and banquet halls. The word "glatt" means smooth in Yiddish. In Jewish Law, the term glatt is used to refer to the lungs of animals. After the animal is slaughtered, the animal is opened and examined to determine whether the lungs are smooth. If the lungs are found to be smooth, the meat is considered to be "glatt kosher". Today a more informal attitude to the meaning of glatt kosher is used, and most understand it to mean kosher to the highest standard, meaning more or stricter rabbinical supervision has been followed for the product or products in question. Today, even non-meat products are labeled as Glatt Kosher.